M-Sport World Rally Team’s Mads Østberg and Ola Fløene secured a comfortable fifth place behind the wheel of their Ecoboost-powered Ford Fiesta RS WRC at this weekend’s RallyRACC Catalunya Costa Daurada. Despite enduring the worst of the conditions through the opening gravel stages, the Norwegians finished the loose-surface tests just 20 seconds shy of the podium; and remained satisfied on Tarmac having taken their new strategy a step further. Focusing on smoother lines and a more precise style, Østberg’s new approach to asphalt driving is starting to pay dividends. He showcased an improvement from the first to second pass yesterday, and posted some encouraging split times throughout today’s final stages. As with any new style, it will take some time to perfect, but Østberg is pleased with his progression which bodes well for the future. Now it’s time to look ahead, and a return to gravel has the Norwegian in a buoyant mood as focus turns to one of his favoured events Wales Rally GB. In the sister M-Sport Fiesta RS WRC, the opening gravel sections allowed Éric Camilli to gain vital knowledge of conditions he had not previously experienced. As the Spanish fixture turned to Tarmac, the Frenchman showed good progress through the circuit-like stages. Regaining confidence throughout yesterday morning, he and co-driver Benjamin Veillas displayed a marked increase in pace with times much closer to those of the leading pack. He had hoped to develop that speed over the second pass but was halted by transmission issues which prevented him from contesting the afternoon loop. Restarting under Rally 2 regulations, the pairing had no choice but to use the gravel transmission which houses ratios not suited to the smooth asphalt. Despite the disadvantage, they refused to let that stand in the way of progress. Proving what advantages experience can yield, the pairing put all of their knowledge from the first pass into practice for the second and made considerable advances. Having learnt and perfected much, they gained 0.75 seconds per kilometre on Pratdip (SS16 and SS18). As the FIA World Rally Championship returns to gravel for the final two events of the year, Camilli will focus on showing similar progress whilst collating the experience that will prove vital to his 2017 campaign. Elsewhere, there was good news in the support classes as Hungarian Frigyes Turan delivered a fantastic performance behind the wheel of his Ford Fiesta R5 to secure his first WRC 2 podium of the year. 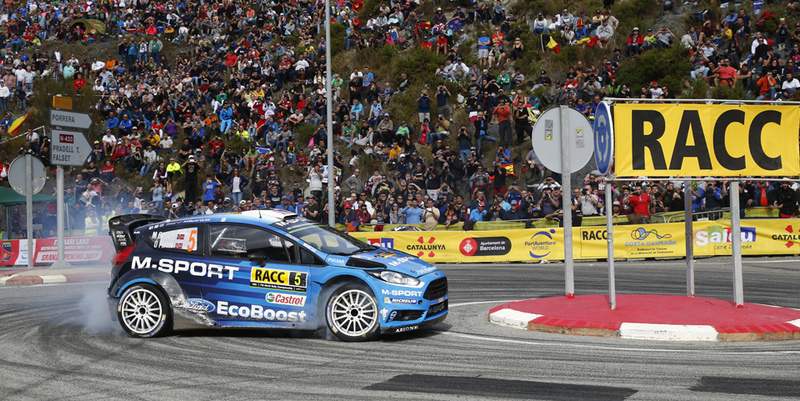 In the RC4 class, Spain’s Nil Solans proved the pace of M-Sport’s one-litre Ecoboost-powered Ford Fiesta R2 by winning 13 out of a possible 19 stages.